In this March 24, 2017, file photo, President Donald Trump, flanked by Commerce Secretary Wilbur Ross, left, and Energy Secretary Rick Perry, is seen in the Oval Office of the White House in Washington, during the announcing of the approval of a permit to build the Keystone XL pipeline, clearing the way for the $8 billion project. A federal judge in Montana has blocked construction of the $8 billion Keystone XL Pipeline to allow more time to study the project’s potential environmental impact. Environmentalists and tribal groups on Friday cheered a federal judge's ruling that blocked a permit for construction of the Keystone XL oil pipeline from Canada and ordered officials to conduct a new environmental review. 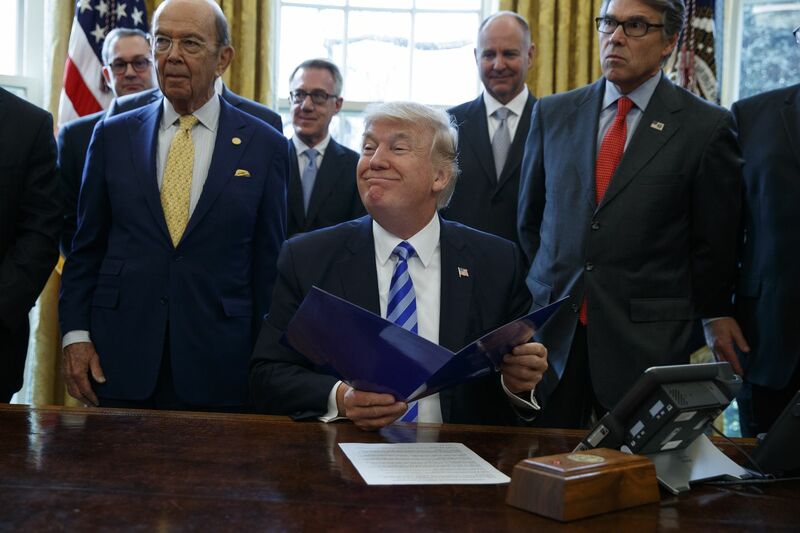 President Trump called the decision delaying the 1,184-mile pipeline — which would begin in Alberta and shuttle as much as 830,000 barrels of crude a day through a half dozen states to terminals on the Gulf Coast — "a political decision" and "a disgrace." Trump has touted the $8 billion pipeline as part of his pledge to achieve North American "energy dominance" and has contrasted his administration's quick approval of the project with years of delay under President Obama. The Trump administration has not said whether it would appeal the ruling. The State Department said it was reviewing the decision but declined further comment, citing ongoing litigation. The pipeline was first proposed by Calgary-based TransCanada in 2008. It has become the focal point of a decadelong dispute that pits Democrats, environmental groups, and Native American tribes who warn of pollution and increased greenhouse gas emissions against business groups and Republicans who cheer the project's jobs and potential energy production. U.S. District Judge Brian Morris late Thursday put a hold on the project, ruling that the State Department had not fully considered potential oil spills and other impacts as required by federal law. He ordered the department to complete a new review that addresses issues that have emerged since the last environmental review was completed in 2014. TransCanada said in a statement that it was reviewing the judge's 54-page decision. "We remain committed to building this important energy infrastructure project," TransCanada spokesperson Terry Cunha said. Tom Goldtooth, executive director for the Indigenous Environmental Network, a Minnesota-based advocacy group that also is a plaintiff in the case, said the ruling was a win for tribes, water, "and for the sacredness of Mother Earth." He called the pipeline "the enemy of the people, the climate, and life as we know it. It must be stopped."